If you’ve been reading my posts for a while, you know that I love finding things to go with the theme we are doing. 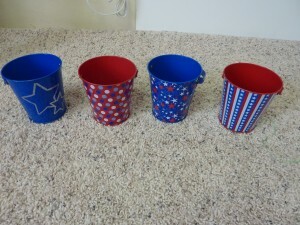 These little July themed pails were in the dollar section of our Target and I know that they are the perfect addition to a July themed My Obstacle Course sorting station. 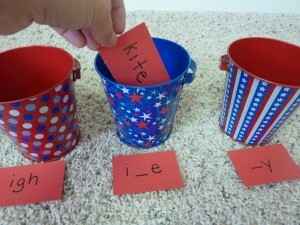 It really is easy to blend a sorting activity, which provides a quick opportunity to build or reinforce an academic skill like spelling patterns, with these thematic pails to create a fun and appealing My Obstacle Course station. 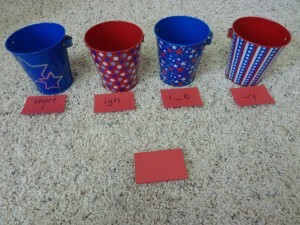 I used some small red index cards and wrote the sorting labels (short i words, words with “igh”, words that follow the i_e (“i consonant e”) pattern, and words that have long /i/ sound made with “y”.). 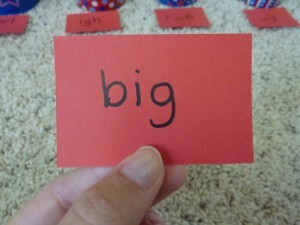 For the sorting activity, I wrote three words that fit each pattern on cards, mixed them up and placed them in a pile. 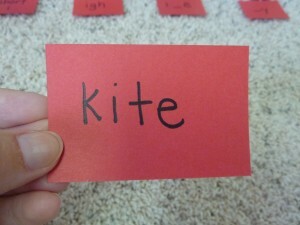 The word "kite" to be sorted into the pail with "i consonant e". Placing the word into the correct pail. "Big" placed in the short i pail. 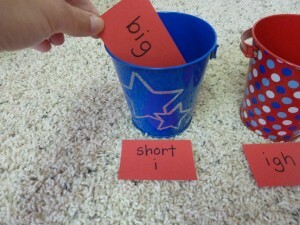 Words sorted into the pails are easy to check when the child is finished. 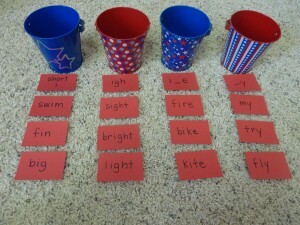 This is something that can be done throughout the year with spelling words but can still look fun by using different colored cards and different sorting containers. The word cards and labels can also be stored and used for future word sorts, review stations or a game like “Guess the Sort”.